Scientists have been trying to confirm the existence of gravitational waves for fifty years. Then, in September 2015, came a "very interesting event" (as the cautious subject line in a physicist's email read) that proved to be the first detection of gravitational waves. 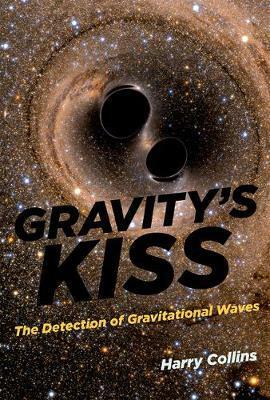 In Gravity's Kiss, Harry Collins-who has been watching the science of gravitational wave detection for forty-three of those fifty years and has written three previous books about it-offers a final, fascinating account, written in real time, of the unfolding of one of the most remarkable scientific discoveries ever made. Predicted by Einstein in his theory of general relativity, gravitational waves carry energy from the collision or explosion of stars. Dying binary stars, for example, rotate faster and faster around each other until they merge, emitting a burst of gravitational waves. It is only with the development of extraordinarily sensitive, highly sophisticated detectors that physicists can now confirm Einstein's prediction. This is the story that Collins tells. Collins, a sociologist of science who has been embedded in the gravitational wave community since 1972, traces the detection, the analysis, the confirmation, and the public presentation and the reception of the discovery-from the first email to the final published paper and the response of professionals and the public. Collins shows that science today is collaborative, far-flung (with the physical location of the participants hardly mattering), and sometimes secretive, but still one of the few institutions that has integrity built into it. ...a gripping day-by-day account of how it became almost universally accepted that gravitational waves had finally been detected. -Times Higher Education It's both a topical must-read, and a future classic of the genre.